A little gardening, cooking, knitting, quilting and more. The Queen of Green, Adria Vasil, has given me way too much credit in her latest podcast, coinciding with this week’s NOW magazine cover article “Home grown”. Although the part about wanting the chickens is totally true. My Mom even had a plan all worked out for me to borrow some hens from my Aunt and Uncle, just for the summer, so I wouldn’t have to worry about caring for them over the winter. But Chris says no way, not while it’s technically illegal. Poo. 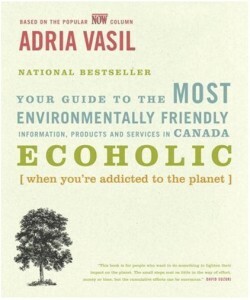 Adria’s first book, Ecoholic: Your Guide to the Most Environmentally Friendly Information, Products and Services in Canada was released in 2007. She’s got an American version coming out soon, and another Canadian book in the hopper as well. Full disclosure: Adria and I have been pals since the late 90s, shortly after I arrived in the T-dot. Next Post Let there be life! Welcome to my blog! I’m Sarah Mulholland, an urban farmer, a kitchen scientist, yarn pack rat and fabric stasher. In my day (and sometimes night) job, I manage social media and community for a small art and design university.